Shown in “The Savings Matrix” are various ending account values at age 65 based on four different starting ages of an investor. The baseline figures (shaded in gray) assume a 6% of income annual contribution rate (or savings rate) into the portfolio and a 6% annualized portfolio return. The variable in this analysis is moving from a 6% savings rate to a 10% savings rate OR moving from a 6% portfolio return to a 10% portfolio return (while in both cases holding the other variable constant). For an investor that began investing in their retirement portfolio at age 25, the terminal value at age 65 was $491,658 (assuming a $35,000 starting salary and a 3% annual increase in pay) assuming a 6% savings rate and an annualized portfolio return of 6%. Interestingly, this individual earned over $2.63 million during her 40-year working career. What if the annual portfolio return increased to 10% and the savings rate stayed at 6%? The portfolio value at age 65 is nearly $1.26 million. On the other hand, if the savings rate increased to 10% per year and the portfolio return stayed at 6% annually the ending portfolio value at age 65 is $819,429 (see figure 1). 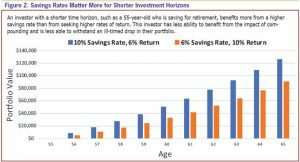 Clearly, for a young investor the portfolio rate of return has more impact than the annual savings rate on the ending account value at age 65. Of course, one might suggest that the best of all worlds for a 25-year old investor is to save 10% of income each year AND have a portfolio return of 10%! No question about that—as the ending portfolio value would be an astounding $2,099,861 (again, assuming a starting annual salary of $35,000 and a 3% annual increase in salary over a 40-year career). Next, we consider a 35-year old investor. Assuming a 6% savings rate and a 6% annualized portfolio return, the baseline ending portfolio value at age 65 is $311,971 (assuming a salary of $47,000 at age 35 and a 3% annual increase in pay). If the portfolio annual rate of return increases to 10% (holding the savings rate constant at 6%) the ending account value at age 65 is $605,655 compared to $519,952 if the savings rate is increased to 10% while holding the portfolio return at 6% annually. 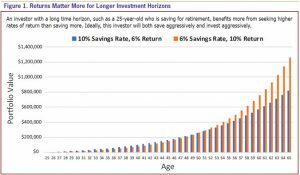 Once again, for a “younger” investor increasing the portfolio return from 6% to 10% provides greater impact then increasing the savings rate from 6% to 10%. Clearly, a 6% or 10% savings rate and a 6% or 10% portfolio return are not the only possible rates of return and savings rates—this I understand. The point of this specifically focused analysis is to isolate the general impact of altering the savings rate vs. changing the portfolio return (by virtue of employing different asset allocation models) at various ages. Now, at age 45, things get interesting. The 45-year old had annual income of $63,200 and a 3% annual increase in pay until age 65. (This income figure of $63,200 is simply a 3% annual growth rate applied to a $35,000 salary for a 25 year old). 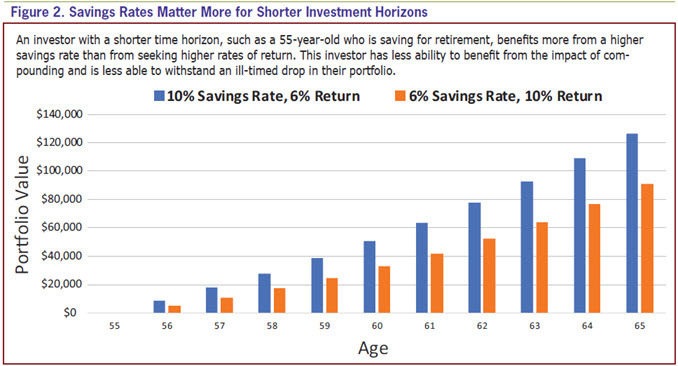 Assuming a 6% savings rate combined with a 6% portfolio return resulted in an ending balance at age 65 of $177,128. If the savings rate increased to 10% (holding the portfolio return constant at 6%) the ending balance increased to $295,214, whereas a 6% savings rate with a 10% portfolio return resulted in an ending balance of $266,657. Advantage to the savings increasing to 10% rather than the portfolio return increasing to 10%. A person who starts investing at age 45 is benefitted more by increasing their savings rate from 6% to 10% than by attempting to increase their portfolio return from 6% to 10%. This may be counterintuitive because conventional wisdom may seem to suggest that if a person is “late to the retirement planning game” they need to make up for lost time by building a portfolio that is largely equity-based—that is, a portfolio that can crank out returns of 10-12% per year. This research suggests otherwise. In fact, the “older” investor needs to save more each year rather than build an overly aggressive, high risk/high return portfolio. Think of it this way, if the time frame of the investor is reduced from 40 years to 20 years (as is the case for a 45-year old who is now starting to invest in his or her retirement accounts) the beneficial impact of compounding (that is, the portfolio performance) has been dramatically reduced by the shorter time frame. The dramatic compounding-based growth in a portfolio really starts to pick up steam after 20-25 years. Thus, with a shorter time frame to work with, a portfolio is benefited more by the direct contributions made to it. Plus, when “juicing” a portfolio to crank out higher returns, the downside risk is significantly larger in any given year. And we should all know by now that a loss of 50% requires a gain of 100% to break even—which clearly suggests that we stay away from big portfolio losses as we age. For example, over the past 48 years (1970-2017) a portfolio design that generated a 6% average annualized return had a worst one-year return of -1.87% (based on an asset allocation of 75% cash, 15% bonds, and 10% large US stock). By the way, that negative return of -1.87% was the only negative return during the 48-year period and, not surprisingly, occurred in 2008. -5.53%. The single big loss of -27.6% happened in 2008. The point being that a higher return portfolio is also a higher risk portfolio—and older investors are not keen on taking large losses inasmuch as they have fewer years in which to recover from such losses. Not to mention the emotional toll that large portfolio losses inflict on investors. For the investor who starts investing for retirement at age 55 raising the savings rate from 6% to 10% increases the ending account value by over $50,000 (from $75,937 to $126,562). By contrast, if the portfolio return increases from 6% to 10% the ending balance at age 65 increased by only $15,073 to $91,010 (see figure 2). Understandably, this is an investor who is starting a bit late. Ours is not the judge why they are “late”, but rather to encourage them to do all they can in preparation for retirement. One thing that must happen, as clearly demonstrated by this analysis, is that the 55 year old should focus on saving more of their income rather than cranking up the portfolio risk in an attempt to make up for lost time. To be more specific, a 55 year old that is just getting started on building their retirement portfolio will need to save more than 10% of their income to hit any sort of reasonable nest egg target value. The practical outcome of these findings is actually quite helpful. What is being suggested here is that older investors should save more rather than build aggressive portfolios that expose them to the risk of large losses in any given year. It is large losses that can emotionally undermine older investors who—naturally—have less time to recover from such losses. Contributions are an investing “variable” that is more in the control of the investor, while portfolio performance (particularly in the short run) is less controllable. 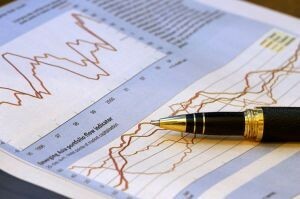 As a result, investors who rely upon the performance of the portfolio to do the “heavy lifting” (that is, to make up for their insufficient contributions during their working years) will usually fall into the trap of having too much equity exposure and therefore be exposed to too much risk of loss. It is my opinion that the performance or “return” of an investment portfolio should accomplish two primary goals: (1) preserve and protect the contributions of the investor, (2) provide a modest rate of return. Understandably, in an era of “super-sized” meals, drinks, vehicles, houses, and egos, the notion of a “modest” rate of return may sound rather unsophisticated. Nevertheless, I’m suggesting that the performance of a portfolio should never be expected to make up for under-saving on the part of the investor. It is our job as investors to adequately contribute to our retirement investment accounts. A contribution rate of 2 to 3 percent of our income into our 401(k) account or individual retirement account (IRA) is simply inadequate. Frankly, I suspect we all know that. But, perhaps we allow a long list of “wants” to put the squeeze on our retirement savings rate. This reminds me of the Fram oil filter commercial many years ago: “You can pay now, or PAY later”. The implication of that advertisement was that the cost later would be much higher than the cost now. The corollary being that an inadequate savings rate now will inflict a heavy price later as our needed nest egg is only a fraction of what it needs to be. If younger investors are willing to take more risk there is a distinct payoff in the long run—and they have a long run to work with. But for older investors to take on more risk exposes them to losses that they have neither the time to resolve nor the emotional stamina to endure. Consider a simplistic, but illustrative, example. A 25-year-old worker begins her career earning $35,000 per year. Her salary increases 3 percent annually over the next 40 years. If she invests 10 percent of her income each year (which could represent a 10% savings rate by her alone OR a 6% savings rate by her and a 4% match from the employer) into a 401(k) each year, she will have a nominal balance of $263,904 accumulated by age 65 assuming a portfolio rate of return of 0%. She has over a quarter of a million dollars entirely as a result of her own contributions—representing the first engine of growth. Now, let’s consider the second engine of growth, namely portfolio performance. If her 401(k) account averages an annualized return of 6 percent per year, her account value at age 65 will be $819,429 (of which $263,904 were her contributions). Clearly the “return” of the portfolio is a significant part of the ending account value, but so are her contributions. Keep this figure of $819,429 in mind as this example continues. Let’s now assume that our 25-year-old worker invests only 2 percent of her salary each year until she retires at age 65. Assuming a 0 percent return in her retirement portfolio, she will have an account balance of $52,781. Assuming a 6 percent average annualized return over 40 years her balance would only be $163,886. To achieve an ending balance of $819,429 at age 65 (while maintaining her low 2 percent contribution rate), her retirement portfolio would need to generate an average annualized return of 12.6 percent. In other words, her inadequate contributions force the portfolio to do the heavy lifting. Can a portfolio reasonably be expected to produce an average annualized return of 12.6 percent over a 40-year period? Over the past 92 years there have been fifty-three 40-year rolling periods. The S&P 500 Index has never produced a 40-year annualized return in excess of 12.6%. (The highest 40-year return was 12.49% from January 1, 1950 to December 31, 1989). Of course, that represents a 100% equity retirement portfolio which is far more volatile than many investors can stomach. In case you’re curious, the average rolling 40-year return for the S&P 500 Index from 1926-2017 was 10.91%. A more reasonable asset allocation for most investors might be a 60% stock/40% bond portfolio. Never once has a 60/40 portfolio produced a 40-year annualized return of 12.6% or higher since 1926. In fact, the average 40-year rolling return (over the 53 40-year periods since 1926) for a 60/40 portfolio was 9.25%. If our 25-year old worker wants to achieve this target retirement account balance of $819,429 by age 65 AND she earns an average return of 9.25% (the historical average for a 60% stock/40% bond) portfolio she would need to increase her annual savings rate from 2% to 4.7%. But, what if bond returns (40% of the return of a 60/40 portfolio) are not as impressive over the next 10-20 years as they’ve been over the past several decades? In fact, during the 34-year period of rising interest rates from 1948-1981 the annualized return of US bonds was 3.83% vs. 7.86% over the past 36 years from 1982-2017 (a period of generally declining interest rates). During the period of rising interest rates from 1948-1981 a 60/40 portfolio had an average annualized return of 8.52%. So, if we assume a portfolio return of 8.52% our 25-year old worker will need to save 5.6% of her income each year (i.e, a 5.6% savings rate) to hit her retirement target of $819,429 by the age of 65. This type of hypothetical analysis can go on forever. It need not. The analysis already demonstrated sufficiently illustrates a glaring reality: a 2% savings rate will not get the job done to be adequately prepared for retirement. Nor is a 4% savings rate adequate. An annual savings rate of 5.6% is the lowest feasible rate for a 25-year old. Obviously, if you are starting to prepare for retirement at an age of 35 or higher, the needed savings rate will have to increase. The most important thing that can be done right now to help America’s population be better financially prepared for retirement would be to increase the annual savings rate to at least 6% of annual income. An annual savings rate of 10% being the long-term goal. 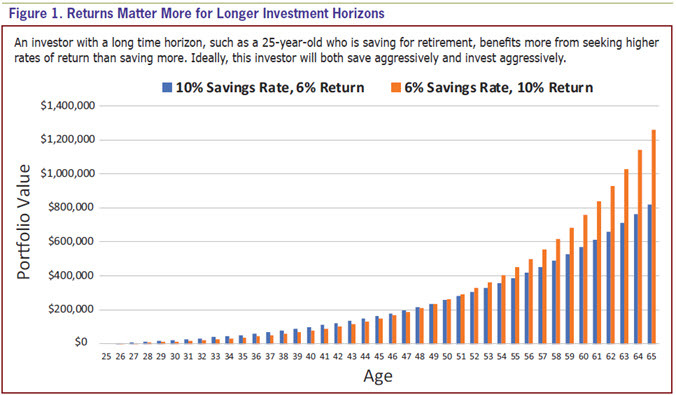 A savings rate of 10% or higher is particularly important for investors over the age of 45. This may seem very discouraging to someone who is doing their best to set aside 4 to 5% of income each year into their retirement portfolio. Don’t be discouraged. If 4% is your best effort right now, take courage in that. However, work toward a 6% savings rate or higher—with 10% being the ideal goal. As with many goals, we have to work our way there over time.